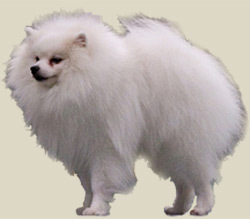 The Toy German Spitz, comes in a wider variety of coat colors; Black, Brown, Orange, Wolf Gray, or White. The compact, triangular ears close together and high set. The hair on the head is short compared the rest of the body, but it is still very thick. The feet are very small with hair in-between the toes. The eyes appear to be proportionally large. The tail is curled on top of the back and lies against the side of the body.